Looks like YouTube is falling back into another old habit of theirs again: where, for whatever reason, certain new uploads won't even show up in your subscription until days later. For example, @hooperfan had uploaded a new clip from SS with Gina and Ruby - accordingly, it was uploaded 3 days ago, but it just now popped up in my subscription feed today. You know what would be nice? 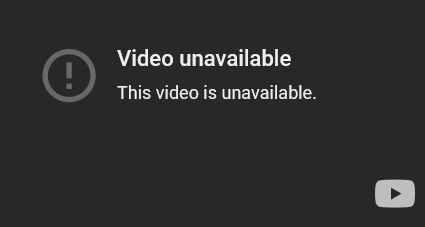 A reasoning for why videos get deleted or are unavailable. They used to do that, actually. Hey, is anyone else having problems with Google Maps right now? Whenever I enter street view and try to move one way down a street, it actually takes me in the opposite direction. I almost feel like I'm walking down the street backwards. Pretty soon, they're probably gonna to back to just saying "This account is suspended" again. Is anyone else having to put up with this new annoyance on Facebook: when you go to type a comment, the comment box is instead replaced with another box with five specific friends it wants to you to tag, for whatever reason? Well, that didn't last long. . . .
YouTube went back to capping how many videos you can have in your watch history at a time - now it's down to 30 videos. The Facebook News Feed problem is actually getting worse - in fact, I don't think the Most Recent setting even works at all anymore: even if you've selected Most Recent (which I always do), it just shuffles the content in any random order that makes no sense. Now YouTube's back to not wanting to load or buffer 1080p videos - only this time, it's been a consistent, ongoing problem for a couple of weeks now. Why does Jeffrey Dahmer always get into my recommended feeds? YouTube always pushes videos and channels they want you to subscribe to. It's always that one ******* interview; the dude is articulate, but thank God he got what he deserved. YouTube now has a new feature for creators called "Premieres," where when you schedule a new upload, it basically turns it into a viewing party: it sends your subscribers notifications 30 minutes before the scheduled time, has a countdown, and enables a live feed so you can interact with your subscribers while the video is being played live (and they can't skip through the timeline). I hope this feature is still around by the time MORON LEAGUE 4 is finally ready to be released. So over a week ago, I uploaded my newest music video, and it had reached up to over 100 views. Now it's down to 44 views. Maybe somebody watched it 56 times and YT just decided to count it as one view? Heh, I dunno. Well I do know for a while there, once a vid reached 301, they would freeze the view count until they verified that each and every view was legit (like, no repeat views from the same account or IP address, or no partial views, etc). But, I mean, gee whiz!